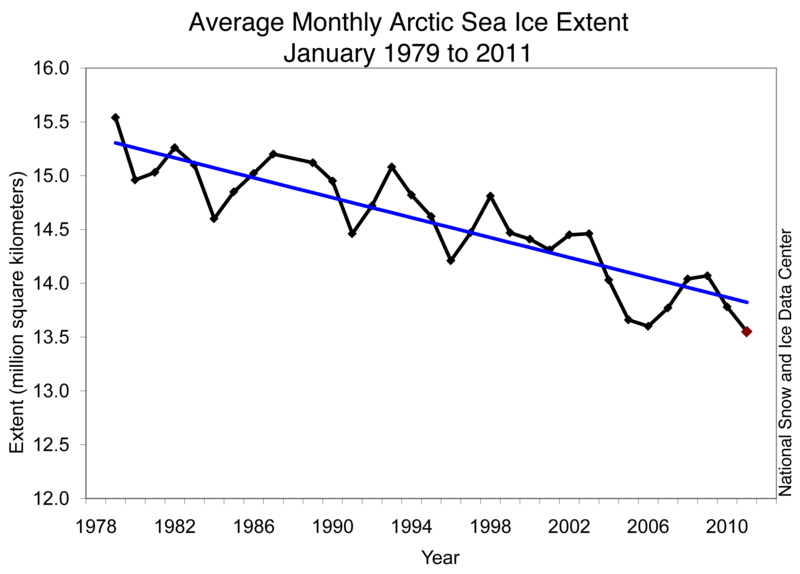 Arctic sea ice extent for January 2011 was the lowest in the satellite record for that month due to slow regional ice growth compared to past years. This is reported at the National Snow and Ice Data Center. For example Hudson Bay did not completely freeze up until mid-January, about a month later than normal according to Canadian Ice Service analyses. 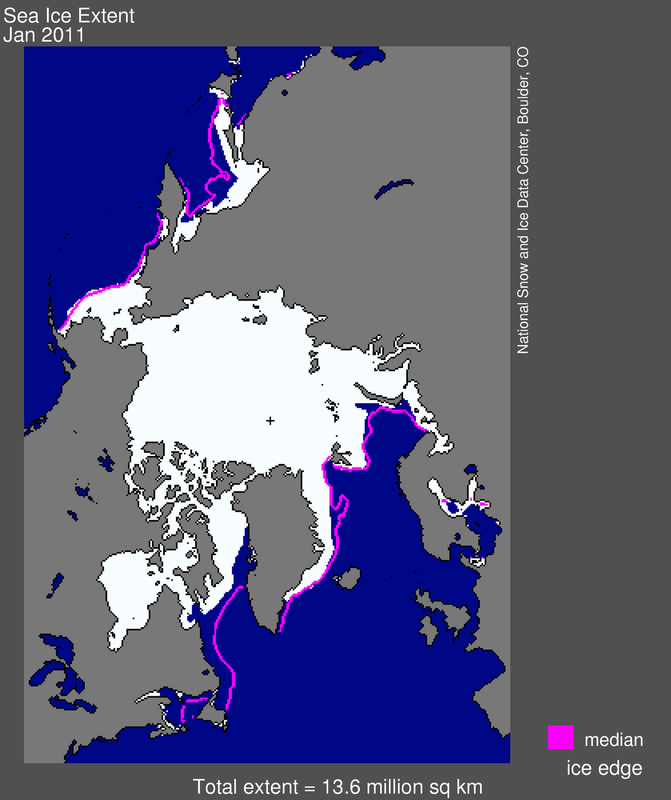 Arctic sea ice extent averaged over January 2011 was 13.55 million square kilometers (5.23 million square miles). This was the lowest January ice extent recorded since satellite records began in 1979. It was 50,000 square kilometers (19,300 square miles) below the record low of 13.60 million square kilometers (5.25 million square miles), set in 2006, and 1.27 million square kilometers (490,000 square miles) below the 1979 to 2000 average. Air temperatures over much of the Arctic were 2 to 6 degrees Celsius (4 to 11 degrees Fahrenheit) above normal in January. Over the eastern Canadian Arctic Archipelago, Baffin Bay/Davis Strait and Labrador Sea, temperatures were at least 6 degrees Celsius (11 degrees Fahrenheit) higher than average. Temperatures were near average over the western Canadian Arctic Archipelago and Scandinavia. Some scientists have speculated that more frequent episodes of a negative Arctic Oscillation, and the stormy winters that result, are linked to the loss of sea ice in the Arctic. Dr. James Overland of NOAA Pacific Marine Environmental Laboratory (PMEL) recently noted a link between low sea ice and a weak polar vortex in 2005, 2008, and the past two winters, all years with very low September sea ice extent. Earlier work by Jennifer Francis of Rutgers University and colleagues also suggested a relationship between autumn sea ice levels and mid-latitude winter conditions. Judah Cohen, at Atmospheric and Environmental Research, Inc., and his colleagues propose another idea—a potential relationship between early snowfall in northern Siberia, a negative phase of the Arctic Oscillation, and more extreme winters elsewhere in the Northern Hemisphere. More research on these ideas may shed light on the connections and have the potential to improve seasonal weather forecasting.